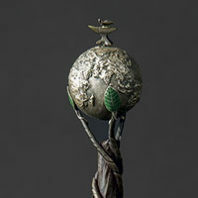 The ornate Washington State University mace, a convocation and commencement fixture, is perhaps the most widely recognizable of artist Tim Doebler’s creations. But his artwork is interwoven throughout the University. Commemorative and recognition placards in building lobbies. A stone monument on Terrell Mall. Finely crafted tokens of appreciation awarded to University leaders and supporters. “I see this as part of the fabric of the University,” says Doebler ’84 MFA, who is retiring in November after 38 years as an engineering technician with WSU’s fine arts department.